Himstates website is aspired to provide you competitive exams information, questions and answers ,formulas etc. Ratio and proportion is an important topic for competitive exams, entrance exams as well interviews. 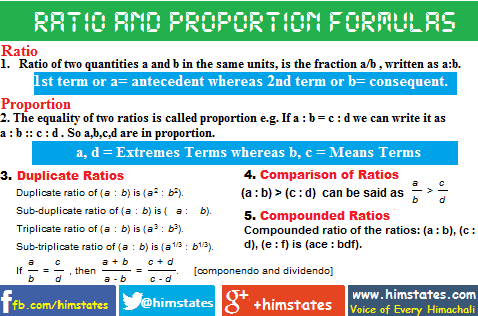 Download full PDF of questions and answers on the topic of "Ratio and Proportion'. 'Ratio and proportion' important in which Competitive Exams ? Ratio and proportion aptitude questions are also important in state(Himachal Pradesh) competitive exams of HPPSC, HPSSSB, HPBoSE and many more exams of Banking as well as entrance exams etc. Fourth Proportional : If a : b = c : d, then d is called the fourth proportional to a, b, c.
Third Proportional : a : b = c : d, then c is called the third proportion to a and b.
Q. 3. Sum of money is distributed among Rohit, Ritika, Vibhuti and Shrawan in proportion of 5 : 2 : 4 : 3 , If Vibhuti gets Rupees 1000 more than Shrawan , what is share of Ritika ? Q. 10. If 40 % of a number is equal to 2/3 of another number , than find out ratio of first number to second number. Q. 11. If a:b = 2:7 and b:c = 6:7 than find a:b:c ? Q. 12. The Duplicate Ratio of 4 : 7 ? Q. 13. The Triplicate Ratio of 2 : 3 ? Q. 14. The Sub - Duplicate Ratio of 4 : 25 ? Q. 15. Third Proportional to 1 and 2 is ? Q. 16. Fourth Proportional to 2, 4 and 8 is ?